The resort comprises a wide variety of villas and apartments, set in a fantastic environment, on one of the few remaining undeveloped sandy beaches in the world. Newly built in 2011, this beach resort has a total of 286 villas and apartments. Amenities include 24-hour reception, spectacular landscaped gardens, 4 restaurants and bars, a spa and gymnasium, two communal pool areas and a shop. All villas have private pools and gardens, and all the apartments have terraced areas. Business travellers can make use of the conference facilities and a laundry service is also offered (fees apply). Meliá Dunas is a 5 star beach all inclusive resort situated on the south west coast of the island of Sal in Cape Verde, set on Algodoeiro Beach, a 5 minutes drive from the colourful town of Santa Maria and only 15 minutes from the international airport of Amilcar Cabral. 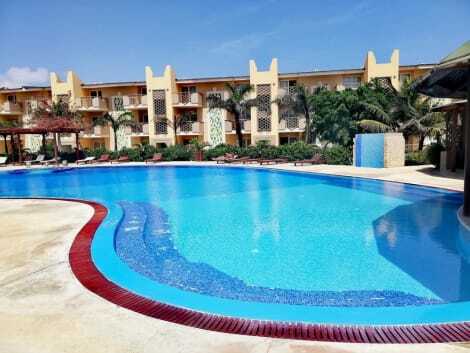 This All Inclusive holiday Resort, it is the perfect choice of holiday location for leisure and relaxation, offering sandy beaches situated in front of a coral reef with an exuberant variety of marine fauna. 6 restaurants and 14 bars together with 5 adult pools and 2 children pools are just some of the services available as well as THE LEVEL service for adults recommended, special activities for children and life enriching activities for adults. The YHI Spa ,Fitness Club and sports areas offers options for all our guests. The Murdeira Village is a resort located in the Bay of Murdeira, Sal Island - Cape Verde. Completely renovated and now under management of MBC, the resort comprises a total of 40 modern suites with 50m2 each, an à la carte restaurant and buffet of national and international cuisine, lounge bar / snack bar, wi-fi, shuttle service , saltwater swimming pool for adults and children, two exclusive beaches, parasols and sun loungers, tennis, futsal and children's playground among other services of leisure and convenience, as well as various outdoor activities. With a high quality service, the Murdeira Village Resort is the ideal space for those seeking the tranquility and exclusivity of Murdeira Bay. Here, guests can opt for various food schemes, taking advantage of the magnificent views of the restaurant a few meters from the sea. All units have a bathroom equipped with hair dryer and amenities, air conditioning, telephone, satellite LCD TV with 20 channels, free wireless internet, free safe, tea and coffee making facilities, microwave, fridge and balcony or terrace. Murdeira Village Resort is 5 kilometers from Amílcar Cabral Airport, 8 kilometers from the village of Espargos and 10 kilometers from the tourist town of Santa Maria. It is open all year round, with a professional and knowledgeable team in the local market. 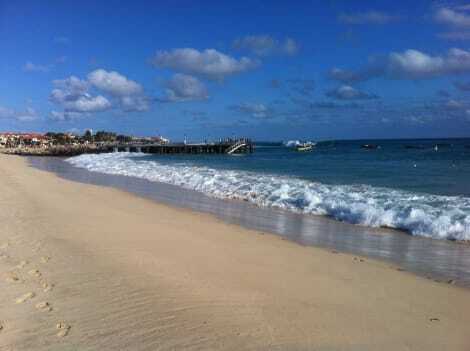 Santa Maria is a fishing town situated in the southern part of the island municipality of Sal, Cape Verde. Santa Maria is located about 16 km south of the Amílcar Cabral International Airport, and km south of the island capital Espargos. Sol Dunas is located right on the seafront at Algodoeiro beach, opposite a coral reef with an exuberant variety of marine wildlife. It is also the best option for discovering and getting to know Island of Sal in Cape Verde, thanks to its natural beauty, impressive tropical gardens, eternal summer climate and luxurious facilities. Ideal for visiting with your family, friends or partner, Sol Dunas has 843 large bedrooms fitted out with everything you need in order to guarantee a perfect stay, free internet access (Wi-Fi) in communal areas; 4 swimming pools (3 for adults / 1 children´s pool); a Yhi Spa and a complete gym (accessible at Meliá Dunas); there are different gastronomic areas (Spice and O Grille); 4 bars; an amphitheatre for shows and themed parties; boutiques and shops in the Boulevard area; a hairdressers; 2 tennis courts and a Beach Volleyball court. A spectacular new luxury All Inclusive resort for adults only located right on the fabulous beach of Algodoeiro overlooking a coral reef rich in sea life, the Melia Llana Beach Resort & Spa is the best option for discovering and exploring the island of Sal in Cabo Verde, thanks to its natural beauty, stunning tropical gardens, its eternal summer climate and luxury facilities. In these idyllic surroundings, Melia Llana Beach Resort & Spa offers all the services and facilities that characterise a resort of this category: spacious, elegant rooms and suites, professional, superior quality service; Wi-Fi Internet; exclusive The Level service; beautiful swimming pools; a great YHI Spa where you can relax and unwind. A fully-equipped gym and a wide range of fine dining options, all of which make this hotel an authentic gem on the shores of the Atlantic Ocean. This apartment has 3 floors in 1 building and offers complimentary parking nearby. Recreational activities include ecotours nearby, segway rentals nearby, and boat tours nearby. Make yourself at home in one of the 85 air-conditioned rooms featuring minibars and flat-screen televisions. Rooms have private balconies or patios. Complimentary wireless Internet access keeps you connected, and satellite programming is available for your entertainment. Bathrooms have showers and hair dryers. lastminute.com has a fantastic range of hotels in Sal, with everything from cheap hotels to luxurious five star accommodation available. We like to live up to our last minute name so remember you can book any one of our excellent Sal hotels up until midnight and stay the same night.